You can get into endless fights on the Internet over whether anime dubbed in English is as good as the original Japanese It all depends on the actors and execution as to whether or not your typical anime dubbed in English works as well as intended. Phil Harman, for example, did a funny but notorious voice-over for the cat in Kiki's Delivery Service that, as anime dubbed in English, changed the character from a sweet, shy little thing into a wise-cracking know-it-all more palatable to Western audiences. Whether such anime dubbed in English changes are an improvement or detract from the viewing experience is difficult to say. Anime dubbed in English requires artistic choices to suit the English-speaking markets. 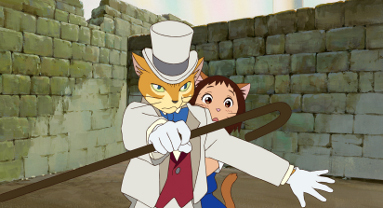 In "The Cat Returns" (2002), directed by Hiroyuki Morita, Studio Ghibli was able to assemble an outstanding American voice cast to have the anime dubbed in English. 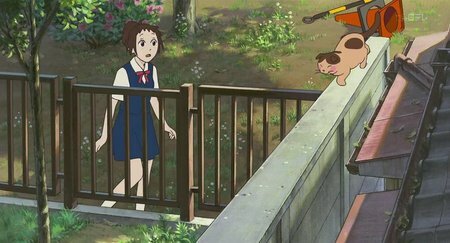 Haru (Anne Hathaway: all actors listed are from the anime dubbed in English version) is a shy and quiet high school student is know for being able to talk with cats. She saves the life of a cat with odd eyes one day and he turns out to be Luna, Prince of the Cats (Andrew Bevis). She is confused when his father, the King of Cat (Tim Curry)s, comes that night to offer his son in marriage as a reward. The King interprets her reaction to have accepted the offer. Haru has second thoughts and, guided by a sweet female voice, visits the Cat Bureau to straighten things out. There, Haru meets Muta (Peter Boyle), a large white cat, who takes her to see the Baron (Cary Elwes), the Cat Bureau's founder, and Toto (Eliott Gould) a raven. Both the Baron and Toto are statues that can come to life. Haru and Muta are taken to the Cat Kingdom while Toto and the Baron follow behind to the entrance to the Cat Kingdom, which is a sequence of lakes forming the image of a cat's paw. 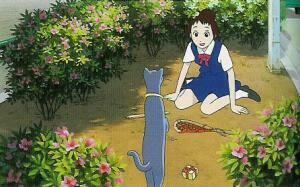 Haru turns partly into a cat with tan paws, ears and whiskers so that she will make a suitable bride for Prince Luna. 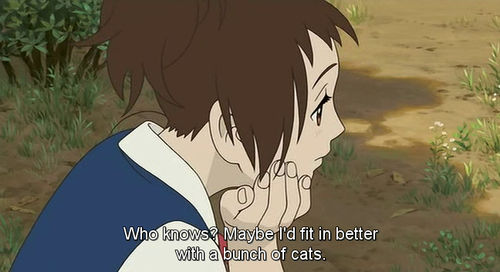 Baron tells her at dinner that she can continue becoming a cat if that is her destiny, it all depends on what she wants. The palace guards attack Baron, and he, Haru and Muta have to flee from the castle in a tunnel shown to them by a sympathetic female white cat servant Yuki (Judy Greer). The Cat King wants Haru to stay in the Cat Kingdom and become his daughter-in-law, so he tries to stop the three from escaping. They find a way out in a tower that has a portal to the normal world. Prince Luna, though, doesn't really want Haru, he wants to marry Yuki. Yuki turns out to have been the female voice that instructed Haru to go to the Cat Bureau in the first place as repayment for a childhood act of kindness by Haru toward Yuki. She is the title character of "The Cat Returns." Muta, meanwhile, is a wanted criminal in the Cat Kingdom for eating too many fish. Prince Luna and Toto help the three fugitives escape. Haru discovers that she actually likes the Baron, and he hints that there may be more adventures waiting for her at the Cat Bureau. The Baron is a character from a manga from Aoi Hiiragi concerning a girl who writes fantasy sequences, one of which created the Baron. The manga was turned into "Whispers of the Heart," and the character of the Baron was so popular that Studio Ghibli decided to do another film featuring him. It began as a short created on commision for a theme park, and then was worked up into a full-fledged screenplay by Reiko Yoshida. Morita, one of the studio's animators, developed it into a feature film. 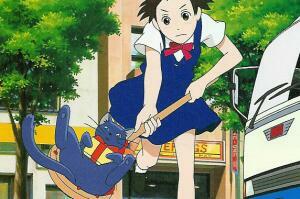 This was the studio's follow-up to the hugely popular "Spirited Away," and "The Cat Returns" was a big hit as well. 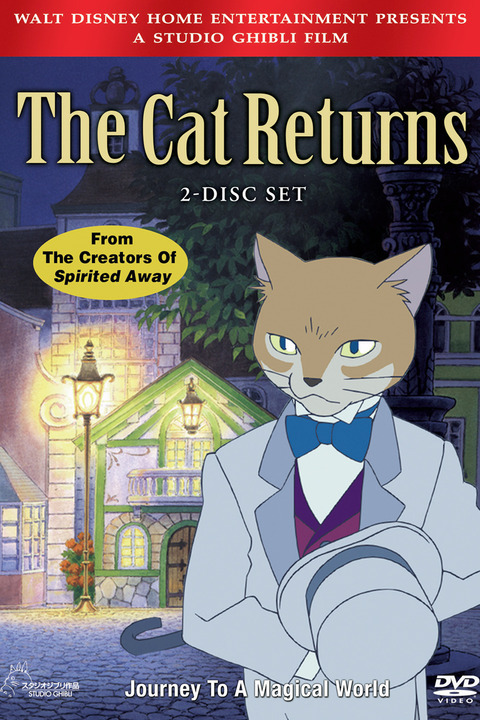 "The Cat Returns" is an animed dubbed in English that takes a while to pick up speed. Once it does, though, this anime dubbed in English moves at a very fast pace. Cat lovers will enjoy all the varied personalities in this animed dubbed in English of the cats acting just like cranky, innocent and suave humans. The cats are very determined in this anime dubbed in English and will not take "no" for an answer from the shy young girl Haru. There is a lot of humor, such as when the cats try to make Haru laugh at dinner in the Cat Kingdom. 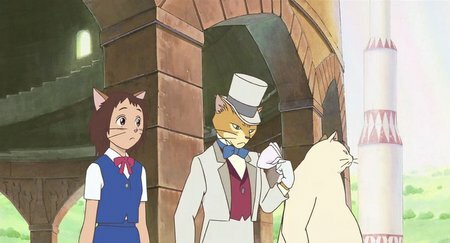 The Baron is very suave (like Puss in Boots, another smooth-talking animated cat) and makes it believable that someone might actually fall in love with a cat. Anne Hathaway is a delight as Haru in this anime dubbed in English. She is cute, like her character, and keeps the voice light and simple. She may be a bit whiny at times. Peter Boyle is comically grumpy, while Elliott Gould provides a distinctive sound to the voice of Toto. Tim Curry uses an unusual voice for his part that does not really add much to the character of the Cat King. A better choice (if available) for the Cat King in this anime dubbed in English would have been someone like James Earl Jones, whose deep voice would have added depth to the character. Cary Elwes is the true star of this anime dubbed in English, though, giving The Baron a seductive and almost aristocratic personality that carries the entire film. The Baron protecting Haru - "Away, you ruffians!" 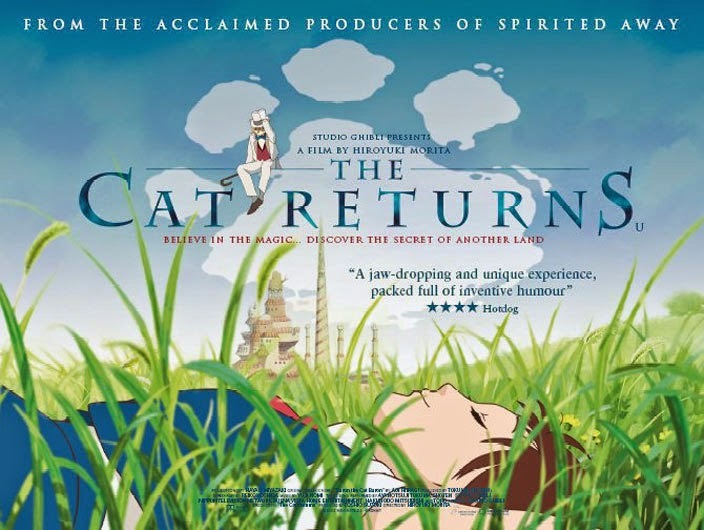 At heart, "The Cat's Return" is a quick, breezy fantasy for children, somewhat similar to other Ghibli Studios productions such as "Spirited Away" and "My Neighbor Totoro." If you liked "Kiki's Delivery Service," you probably will enjoy this film, too. It has delightful moments that will enchant children, though the story is kept very simple, and the anime is fairly weak for a Ghibli feature film. The score is by veteran Yuji Nomi, and he relies heavily on a full orchestral sound. The animation, especially in the background, is very good, but the character designs purposefully are kept simple, which may be disconcerting to modern audiences used to 3D and other highly enhanced animation features. The biggest complaint is that the characters look a bit cartoony, but only true anime dubbed in English experts will likely notice anything like that. The good news is that other Ghibli features have better animation, so if you like "The Cat's Return," you will like those anime dubbed in English features even more. 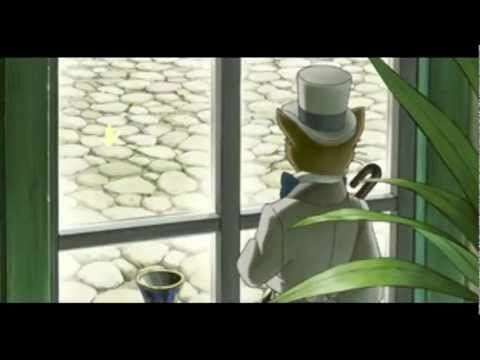 "The Cat Returns" is a very good choice for children, the anime dubbed in English version is great. This anime dubbed in English feature should give them a lot of pleasure. The trailer (with subtitles) is below for your convenience.